The Yale edition of the Book of Mormon text uses the word "between" 33 times in a meticulously consistent way. Entity A is between entities B and C when B & C are analogous but A is apart and dissimilar. This is precisely what we would expect from the OED etymology of the word "between" (by twin or by twain) and its examples of word usage from Early Modern English. "A peace made betwene the Emperorure and the Kinge." Charles Wriothesley, A chronicle of England during the reigns of the Tudors, ca. 1600. The emperor and the king are of the same genre, while peace is something else entirely. "Which beddes are deuises made of Cotten wooll, and hunge vp betweene two trees..." Archbishop George Abbott, A briefe description of the whole worlde, 1599. The trees are twins. The hammock is distinct. "The place where his tent was at ye first, betwene Bethel and Ay." Coverdale Bible, 1535. The two toponyms are analogues. Abraham's tent is different. This same pattern of outlier A by correlates B & C holds throughout the text. The following verses document all unique phrases containing instances of the word "between" in order of first attestation. The text is scrupulously consistent in its usage of the word "between." In every case, entity A is adjacent to but separate from and substantively different than twin, correlate or parallel entities B & C. This pattern has a profound implication for Book of Mormon geography. It means the Isthmus of Tehuantepec (or any other wide isthmus) cannot be the small neck of land described in Alma 22:32. The Isthmus of Tehuantepec is an unbroken continuum, a major land mass including continental divide and rivers flowing toward both oceans. Tehuantepec as the small neck, integral with both the land northward and the land southward on either side of it, overtly contradicts the textual pattern. Most of the boundary between the land northward and the land southward may still pass through the Isthmus of Tehuantepec. Virtually all LDS Mesoamericanists who treat the Book of Mormon believe the Coatzacoalcos River was an important boundary on the Gulf of Campeche. 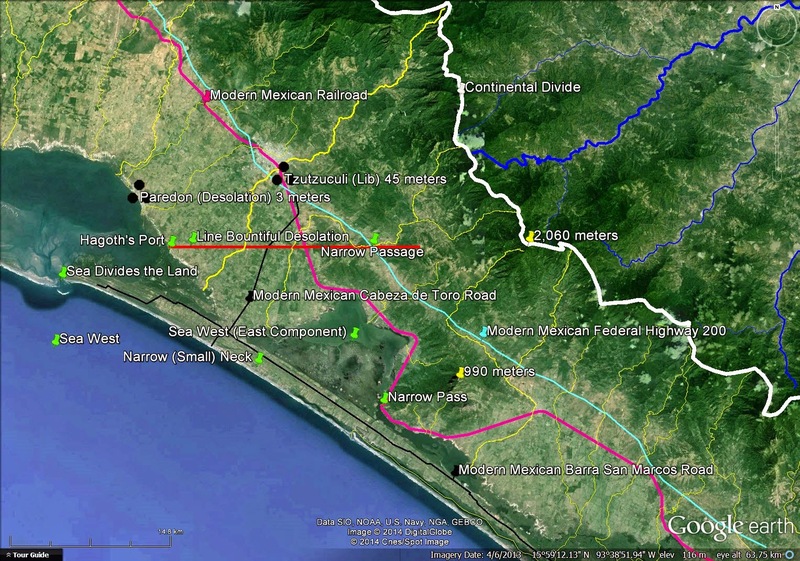 Limhi's exploring party could still have traveled through the Isthmus of Tehuantepec. The text never says those 43 intrepid men passed through the narrow (small) neck of land. It only says they made it from the land of Nephi to the land of Cumorah and back again. Conjecture on the part of many that the narrow (small) neck of land is an isthmus and therefore all land movement between the lands northward and southward must have passed through it is not supported in the text. The narrow (small) neck of land is a coastal feature Ether 10:20 associated with one and only one sea, the west sea Alma 22:32, Alma 63:5 which means it is a narrow peninsula. See the article "Red Herrings." Our correlate for the narrow (small) neck of land could hardly fit the text and its Early Modern English sense of meaning more precisely. Barra San Marcos is a long, slender peninsula separated from the mainland by a series of coastal lagoons. The text uses the similar word "betwixt" 6 times, sometimes as a synonym for the Book of Mormon usage of "between" and other times with unique meanings. This is precisely what we would expect from the OED senses of meaning for the archaic "betwixt." 2 Nephi 15:3 inhabitants of Jerusalem and men of Judah, judge I pray you betwixt me and my vineyard (citing Isaiah 5:3). This is a parable where the house of Israel is compared with a well-tended vineyard 2 Nephi 15:7 whose master, Jehovah, has done everything necessary to bring forth good fruit 2 Nephi 15:4. The Israelites themselves have willingly embraced sin and corruption to such an extent Jehovah has decided to destroy them 2 Nephi 15:5-6. As a witness that His harsh judgement is just, Jehovah asks the Israelites themselves to decide whether the master of the vineyard (me) or the people (my vineyard) caused the bad fruit leading to destruction. This self-evaluation is what David did unwittingly when the prophet Nathan told him the parable of the ewe-lamb (2 Samuel 12:1-5). Sinners thus condemn themselves as in Job 15:6 and Luke 19:22. In 2 Nephi 15:3 inhabitants of Jerusalem and men of Judah A must judge betwixt Jehovah B and Jehovah's vineyard C. In this case, A & C are analogues while B is exceptional. This is a very different pattern than we saw with the word "between" above, but this usage of "betwixt" is attested in Early Modern English. "To arbytrate, deme, and judge betwixt the said Citie and ... John Wayte." Selections from the records of the City of Oxford 1556. In this case the judicial authority A and the city B are parallel while the individual John Wayte C is of a different order. Mosiah 15:9 standing betwixt them [the children of men] and justice. The Savior is our intercessor, satisfying the demands of justice on our behalf. This pattern has no parallel elements. Jesus Christ A, mortals B and eternal justice C are three very different entities with the Redeemer as mediator. This usage of "betwixt" to show a relationship between divinity, humanity and a concept is attested in Early Modern English. "Upon the near affinity which Pythagoras...conceived to be betwixt the gods and numbers..." Thomas Stanley, The history of philosophy 1650. Here we have a human A perceiving a relationship between the gods B and impressive mathematical precision C.
Alma 35:13 a war betwixt the Lamanites and the Nephites. In this verse "betwixt" shows the familiar relationship we saw above for "between." War A is adjacent to yet separate from the twin nations Lamanites B and Nephites C.
Alma 40:6 a space betwixt the time of death and the time of the resurrection.. Again, this usage follows the familiar form we observed with the word "between" above. Alma 40:9 and Alma 40:21 show that "betwixt" and "between" are functionally equivalent in this context. 3 Nephi 3:23 the line which was betwixt the land Bountiful and the land Desolation. This phrase is from the Yale edition. The 1981 and 2013 LDS editions use the word "between." This is the same line referenced in Alma 22:32 which Royal Skousen in the Yale edition renders "the line between the land Bountiful and the land Desolation." The line A is a political or ecological boundary between the related lands Bountiful B and Desolation C. This is another example of synonymity with "betwixt" and "between." Moroni 9:17 the armies of the Lamanites are betwixt Sherrizah and me.[Mormon]. This pattern of an entity preventing a first person narrator from accessing another entity is attested in Early Modern English. "This screene, that stands betwixt me and the fire..." Bishop Joseph Hall, Occasionall meditations, 1633. 3 of the instances of "betwixt" are used precisely as the Book of Mormon uses "between." This is typical of Early Modern English when, according to the OED, the two words were often used interchangeably. The other 3 instances of "betwixt" have usage patterns very different from the Book of Mormon standard for "between." All 3 patterns unique to the word "betwixt" are attested in Early Modern English. Article updated March 26, 2016.